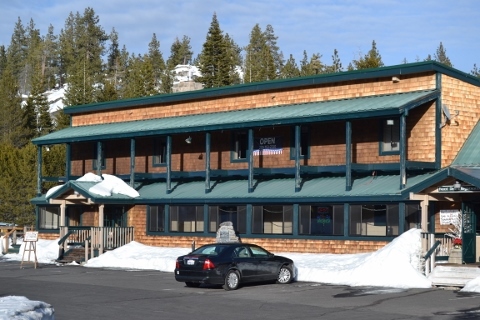 The Tamarack Lodge at Bear Valley, a cure for the common cabin, is an affordable family owned and family friendly Ski Lodge located high up in the Sierra Nevada Mountains, just off scenic all-weather Highway 4. Guests will feel right at home upon arrival with the relaxed atmosphere, professional staff, and comfortable rooms. Fully equipped guest kitchen is available to all guests during their stay. Send your family outside to play on our five acres of land or simply stay inside and enjoy our fireplace. Simply state our BEDROOMS are just that Bedrooms - they do not have TV's or telephone. 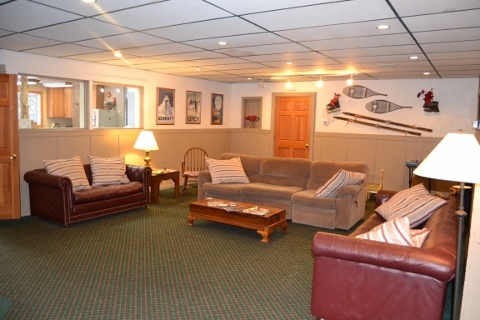 But we offer comfortable common room area in the main lodge with guest kitchen, free WIFI, restrooms, kids play area. YOUR Rooms stay untouched until or departure day, however should need any assistance during your stay the innkeepers will gladly accommodate your needs. Winter offers a small kids sledding hill exclusive for Tamarack guest. Complimentary sleds and snowshoes are available for Tamarack guests to use on the property. Summer offers hiking and biking trails out the back door. After your days adventure come back and relax on the back deck enjoy the opportunity to have a BBQ or evening campfire. Just a stones throw away are Bear Valley Village, Bear Valley Mountain Resort, Cottage Springs X-Terrain Park, Big Trees State Park, Lake Alpine, Spicer, Union and Utica Reservoirs and the Stanislaus River. These offer an array of challenging outdoor activities and endless picture perfect landscapes. The towns along the Highway 4 corridor offer diverse dining, original retail stores, entertainment and numerous wineries. 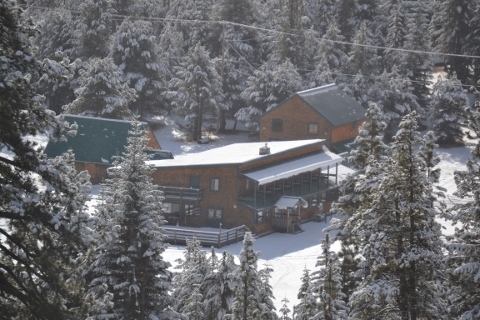 Tamarack Lodge at Bear Valley is ideal for families, small groups, reunions and retreats. Plan ahead and save your dates for and exclusive adventure in the high Sierra's. NEW PET FRIENDLY UNITS - Barn Condo Units Only! $35 for first pet per night, $10 for each additional pets per night. Pet may not be left unattended in the Rooms at anytime. The Tamarack Lodge at Bear Valley, Where Wilderness Meet Home, is an affordable family owned, family run, family friendly ski lodge, located high up in the Sierra Nevada Mountains, just off scenic all-weather Highway 4. Group Bookings (10-50 people), families and individuals are currently available through our online booking system (discount if you book rooms online..offer at the time of booking). MAIN LODGE: Our historic lodge was originally built in the mid 1900's and at the turn of the millennium was extensively remodeled. The lodge can sleep up to twenty five people in it's eight second story rooms. Shared restrooms are at the end of the hallway, separate for men and women, consist of several large sinks, private toilet stalls and private showers. Downstairs there is a large, cozy lounge area where you can curl up with a good book in front of the roaring fire, or take in the scenery outside on one of the sundecks. BACK CHALET: Just behind the main lodge is the Chalet. It can sleep up to 10 -12 people in it's three rooms. Each unit has it own private bathrooms. All the rooms in the chalet are on the ground level, and one room has a fully equipped kitchenette. All rooms have access to a fully equipped guest kitchen located in the main lodge. New summer 2018- 5 campsites - sleeps up to 6 people per site. Two Glamping Tents (sleep 4)- just bring your mattress and sleeping bags. Winter camping also available - Boy and Girs Scouts take Note - this is a great place for your winter Merit Badge. NEW 2019 CAMPSITES and BARN CONDO UNITS are PET FRIENDLY (PET FEEs do APPLY).